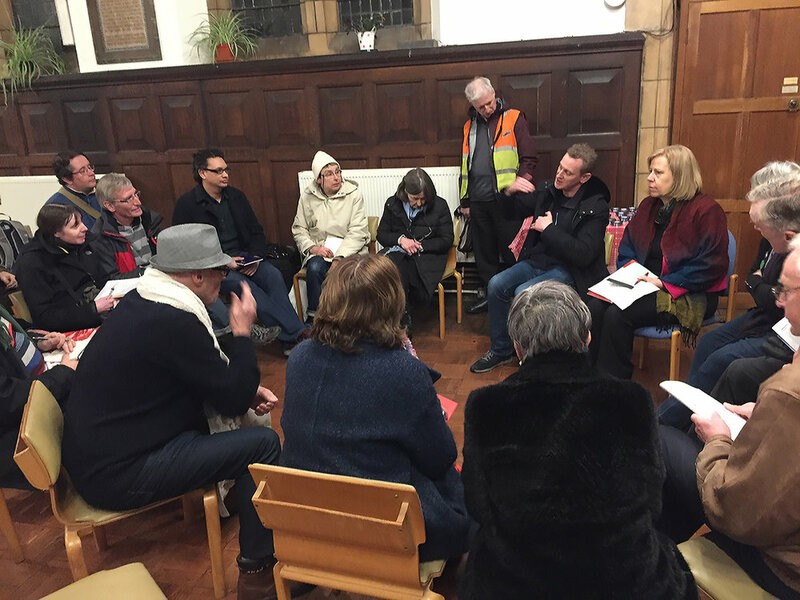 This is a guest blog by René Bach and Stephen Clark, feeding back on an event organised by MVM South West London and Compass West London. The focus of the event was convincing the Labour Party to support PR. Make Votes Matter is a fully cross-party campaign which works with supporters of all parties and none. Is Labour willing and able to capture the progressive majority within this nation by democratising society, empowering working people and hence building a better society for the many and not just the few? It was a dark, cold night and the lights from within the church in Richmond drew plenty of people inside. 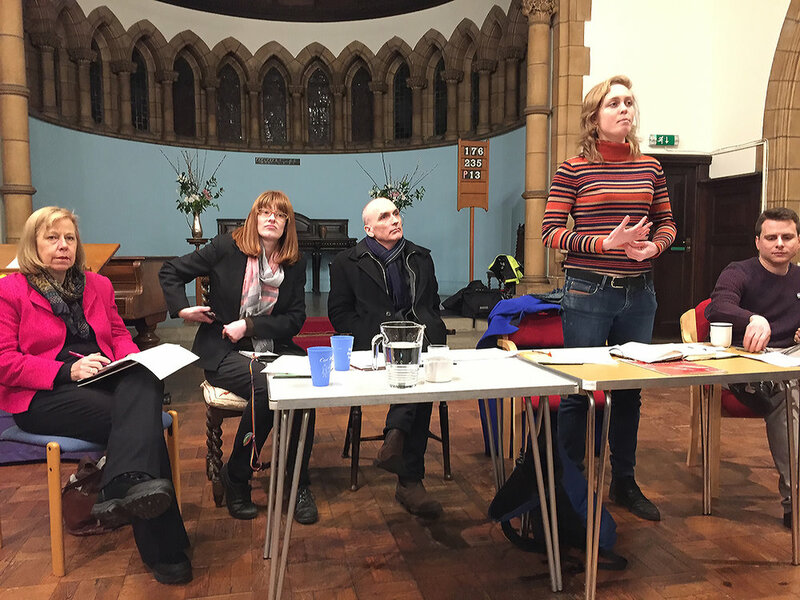 We had the privilege to have one Labour councillor, two Labour MPs and one Labour electoral reform activist on the panel, and plenty of Labour supporters and sympathisers amongst the attendees. For Katherine Dunne, her support for Proportional Representation was a matter of basic democratic principles. While celebrating the centenary of (some) women gaining the vote, she made it clear the job to make every vote matter hasn’t finished yet. Although Labour might feel uncomfortable in sharing power, to break the in-built conservative bias within our current election system and empower the proven progressive majority amongst the population, the natural step would be for Labour to support and implement Proportional Representation. While Ruth Cadbury - MP for Brentford and Isleworth - was previously ambivalent about the need for electoral reform as other pressing issues were more important, she has since become outspoken on PR and currently vice chair of Labour Campaign for Electoral Reform. As the current electoral system allows millions of voters to feel disengaged from the political process with a majority of votes going to losing candidates, a move toward PR would both re-engage people’s faith in democracy and increase the likelihood of more Labour-led governments, which inevitably would lead to a better society. With high recommendation from Momentum we had managed to get Chris Williamson - MP for Derby North - on our panel. He firmly believes an underrepresented progressive majority would be empowered and represented via a genuinely fairer voting system. PR would become a means to an end, which would change and transform society in the long term. With the conservative bias created by First Past the Post, any radical changes made by a Labour/Corbyn Government could easily be overturned when Tories regain power. So a commitment to PR within the next Labour manifesto is essential for transforming Britain for good. Joe Sousek from Labour Campaign for Electoral Reform and Make Votes Matter reported that currently he sees Labour much more receptive toward Proportional Representation. More than 80 Labour MPs firmly support PR and amongst the Labour voters and supporters a recent poll suggested 76% in favour of electoral reform while only 5% were against. LCER and MVM are working hard to get out to various CLPs to engage with Labour members and to encourage motions to be passed to ditch the support for FPTP and include a commitment of PR in principle within the next Labour Manifesto. 1. Why shouldn't Labour just wait for another FPTP election victory? 2. What are the nuts and bolts of moving Labour to PR? 3. Can electoral reform be a vote winner? 4. How important are alliances in bringing changes to the electoral system? - Should we introduce it locally first? - Would it water down a Labour government? - Any party would struggle to get a large majority now and end up with worst of both worlds. - Focus on Principle (for Manifesto). - Language and arguments tailored to the Labour Campaign for Electoral Reform. - Appeal to values - one person/one vote/on value and incorporate PR as part of a wider agenda. - Constitutional Convention to determine electoral system rather than each party has their preferred option. - Fairer = more prosperous. - We need Unions on board. - Commitment to PR within Labour manifesto BEFORE progressive alliance. The evening concluded with some good questions and observations from the floor and answers from our four speakers. Ruth Cadbury rejected the idea that there was strong resistance to PR inside the Labour Party; to such an extent we are pushing on an open door. However, electoral reform wasn’t at the forefront of many people’s minds and, like her previous self, most MPs are ambivalent on the subject. Yet they see the logic, fairness, and transformation PR could bring about when they are pushed on the matter. The general thread for the evening was the importance of the narrative to combine the need for Proportional Representation and democratisation of society with its longer-term positive effect which it would have upon the nation and transforming Britain towards a fairer and more socially progressive country. Thanks to those who came out on such a cold evening!